“IT’S BAAACK.” Jennifer Bennett, a technical director for Google Cloud, announced that Google Glass would be returning. But instead of being a goofy headset that your everyday person can use to covertly record everyday life, it’s geared towards industrial applications. The factory floor is really where people could use some hands-free assistance, and might not mind being goofy while doing it, according to WIRED. OKAY, GOOGLE. If you’re among those who breathed a sigh of relief when Google decided to stop selling its glasses a few years back, I have good and bad news. 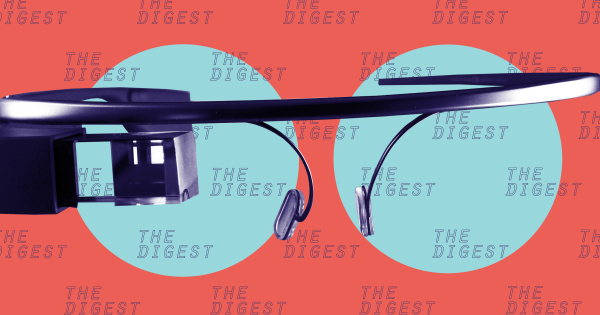 Google Glass resurfaced last summer as the newly-retooled “Enterprise Edition.” If you’re wondering why you don’t have one yet, it’s probably because Google has been marketing these gadgets to businesses, not individual people. And, also, unless you work in a factory, you’re probably no longer its ideal clientele. The new Google Glass Enterprise Edition includes an app by Israeli software company Plataine that basically embeds a smart assistant into each headset. That means the AI system can understand and respond to voice commands either by displaying information on the glasses or responding out loud. Google suspects this can help workers manage their workload, scan barcodes and prepare for projects, and look up recommendations without needing to drag a laptop around with them. THE HAWTHORNE EFFECT. You may recall that gross feeling when you walked by a person wearing Google Glass, that feeling of wondering whether they had just filmed you or subjected you to some sort of facial recognition tech. Well, that element is still there in the Enterprise edition: the WIRED article mentioned that bosses might monitor their employees through their hip new spectacles. While this may boost productivity, it will almost certainly lower morale as employees wonder whether or not their boss is spying on them at any given moment. It’s almost like Google couldn’t resist adding a teensy pinch of technological dystopia to its product.